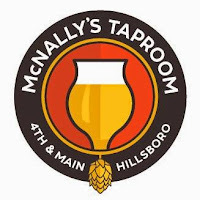 I'll be giving a short presentation and selling copies of my book on Portland's beer history tonight at McNally's Taproom in Hillsboro. It's probably a little late in the game to do this, given the book was published 18 or so months ago. But what the hell. The program begins at 7 p.m. and I plan to speak for 30-40 minutes, backed by a slide show with photos and talking points. The theme? How Portland became the leading craft beer city in the world. After that, I'll open it up to questions and, finally, anyone who wants to purchase a signed copy of my book can do so. Honestly, this is much more of an educational opportunity than a sales event. The book has done reasonably well through online booksellers and traditional bookstores. My own sales efforts at various pubs and events have been less successful, for sure. Such is the nature of books on history. Jim McNally is the owner out there. I first met Jim at a beer collectors event where I was selling my book in late 2013. At the time, he was in the process of opening a taproom in Southeast Portland. That plan changed after several growler fill stations opened in the area. He decided underserved Hillsboro was a better bet. Good thinking. I haven't been out to McNally's, but I understand the place is doing well. They've got 20 or so taps and a pretty solid list. I'm not naive enough to think people from the downtown core will venture out to Hillsboro, but I hope locals will stop by. Looking forward to an evening of great beer talk. Come on man, you've got to do better at self-promotion than that. Don't be fair and balanced when you're pitching cool events, sell them. It looks like a great event, and you are one of the handful of people in the world who can bring real information and insight (as opposed to the bloviating most of the rest of us has to offer). I appreciate the sentiment, but it's a little late in the game, my friends. The folks at McNally's have been promoting with flyers around the pub and on Twitter. No Facebook event, for some reason. I should have handled that, I guess. No big deal. This is a program that should have happened in the downtown core long ago, but there have never been any takers. I probably haven't positioned it right. We'll see what happens. Maybe this is a test run for some kind of tour. Or maybe not. After all, history is bunk.